Frenchman Cyril Despres took yet another victory on stage 13 of the 2009 Argentina – Chile Dakar to maintain second position in the overall standings. The RedBull KTM rider has shown that he has the pace to match race leader Coma but remains 1h 28 03s adrift following his tyre problems on the opening day of the event. In the drastically shortened stage due to heavy overnight rain, Despres took the win with a time of 2h 33m 35s finishing 1m 45s ahead of Coma whilst extending his slender advantage over Yamaha mounted David Fretigne in third. 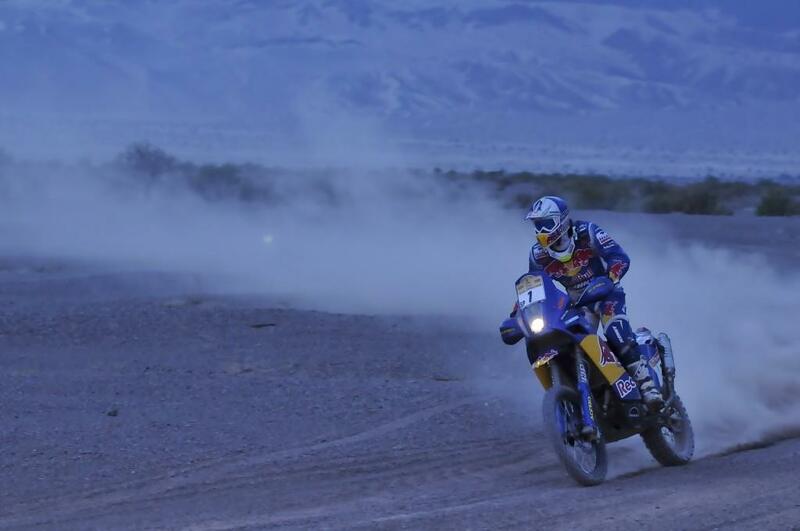 Coma now has just 227KM separating him from his second Dakar victory. The Repsol KTM rider last won the event in 2006, but knows from bitter experience that mistakes can happen. In the 2007 Dakar he led the race going into the final day but crashed out forcing him to withdraw; gifting Despres the overall victory. Brits Mick Extance and Stanley Watt were separated by just five seconds at the end of the stage claiming 32nd and 33rd places respectively. Craig Bounds secured 47th spot with Simon Pavey in 48th. Ewan Buchan had another good day to end up in 59th with Gary Ennis placed 106th. Frenchman Cyril Despres secured his second stage victory to extend his overall lead of the Dakar.